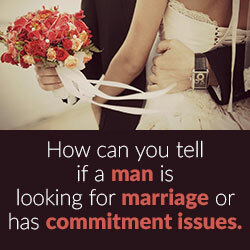 How can you tell if a man is looking for marriage? Question: I am looking to meet husband material. What signs can I tell they are men looking for marriage not just saying they are looking for marriage? Answer: This is kind of a catch 22 question, because most men who say they’re looking for marriage actually are. However, everybody has commitment issues on some level. It just manifests itself in different ways. Some people change jobs a lot, others move frequently, others have committed relationships only with unavailable or inappropriate people. 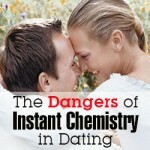 But most people don’t recognize any commitment issues until something triggers them. 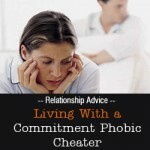 What causes people to get hurt is that for commitment-phoebes the better the relationship, the more anxiety they feel. And then they usually assume their partner is causing it and is therefore a bad choice. When in reality it’s because they’re a good choice and a commitment might actually come to fruition. And that scares them. So a guy who has dated a lot but has never really been in love may have no idea how much anxiety he’ll feel when he finally finds the one. If that’s you, you have to remain very empowered and not act insecure when things start to melt down. The signs to look for are someone who’s moving too fast. Subconsciously he knows it won’t last so he will pull you into the relationship with no fear. Make sure you slow down the pace. He may start to find fault with you, even trivial things. Don’t let that feed your insecurity. Tell him you feel he is being judgmental and don’t be defensive, just give him a little space. He may find ways to escape the relationship: going out with friends, taking trips without you, engaging in activities that don’t include you. Again, give him space and find things to do on your own. And don’t bring up any topics about commitment—moving in together, marriage, babies. If he does, be cautious about the timing. When he knows he has you is when his anxiety will start. But probably most importantly, if you have had a string of failed relationships because of your partner being unavailable in one way or another, take a look at your own issues. People with passive commitment issues subconsciously seek out unavailable people too. Truly available people won’t be attractive to you until you acknowledge your own subconscious fear.